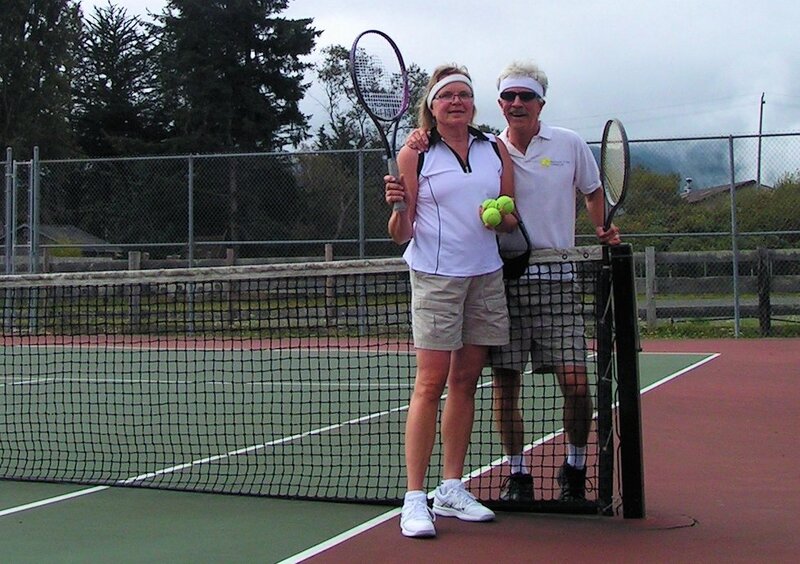 Lena and I used to play a lot of tennis, but it's probably been twenty years since we've played. 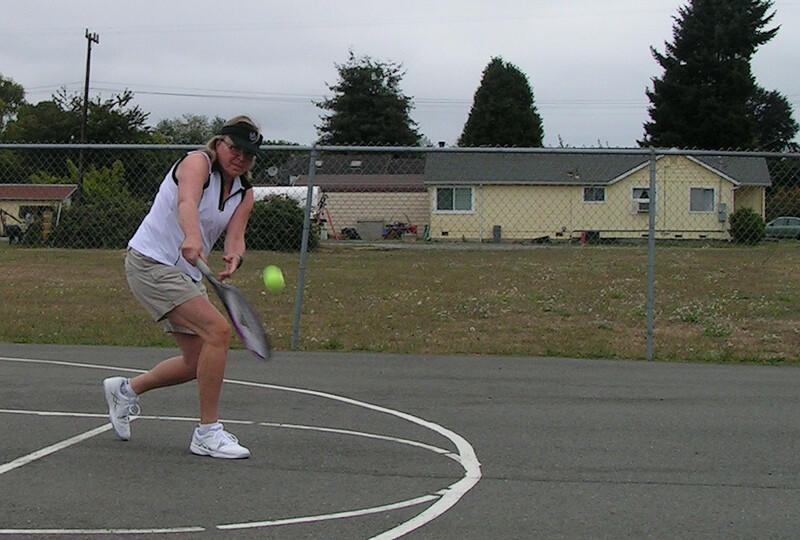 On a recent bike ride, I rode by a well-maintained tennis court that we could use for free. Great, that's all I need. Another hobby! I thought I'd surprise her with a mystery trip and go play. These are my shoes. They should work fine, right? Our graphite racquets seem okay. Lena only has running shoes, so I thought I'd order a pair of ASICS tennis shoes in the same size as her ASICS running shoes. Should fit, right? I've sprained my ankle a few times in my life, so that would be my main concern, but I'll probably be okay. Anyone else go back to playing tennis after a long layoff? I'm not a tennis player but my wife is. Before I became more limited I participated in a number of activities (running, backpacking, biking etc.) that required properly fitted foot wear. You already know from your experience riding that not all shoes fit the same, feet change, and there is a limit to their effective life. Sometimes this happens before they appear worn. Why not consider the both of you going to a tennis shop and try on a few different pairs of shoes for the best fit. Avoiding blisters (moleskin/molefoam is your friend) and injuries from poorly fit shoes could slow down your reentry into any sport. You can then check their ratings on the internet for durability and other people's experience. I wish I could join my wife playing tennis. It's a fun sport. Instead I'm fixing up my old (26 yrs) hybrid bike so I can at least ride the neighbor hood with her. Yes, good point, but I'm into surprises. That is, I hide things in the trunk, we drive to the town with the courts and I pull out the racquets, balls, and box with the new shoes. Ta-daa. The shoes I got her on Amazon have an easy return policy, so, worst case, we don't play that day. She's bought ASICS running shoes from Amazon for years, and they've always fit, but I realize I'm taking a chance. I am a long time tennis player still playing 4 times a week. Running shoes are designed to go straight ahead. They may not provide enough support for the quick-turning, side to side motions on the tennis court. If you are interested in playing tennis I would recommend getting shoes designed for the game. Right. The shoes I bought for her are ASICS tennis shoes. Mine are basketball shoes. The wrong size shoes came yesterday (I could tell because they were significantly smaller than Lena's other shoes). Apparently 9.5 B (M) doesn't mean 9.5 B (Men's sizing). Typical stupid system to have a size system that's different if the shoe is intended for a man or a woman. But returns are indeed free and easy. So a new pair will come on Friday. From watching the US Open this past week it's apparent the US men sure need an influx of new young tennis talent. I don't see any men's tennis players from the US that have a chance of beating any of the top players. As a (twice) returned tennis player and also an ex-shoe salesman (anyone remember Kinney's...I started working there at 15) I feel qualified to respond here. 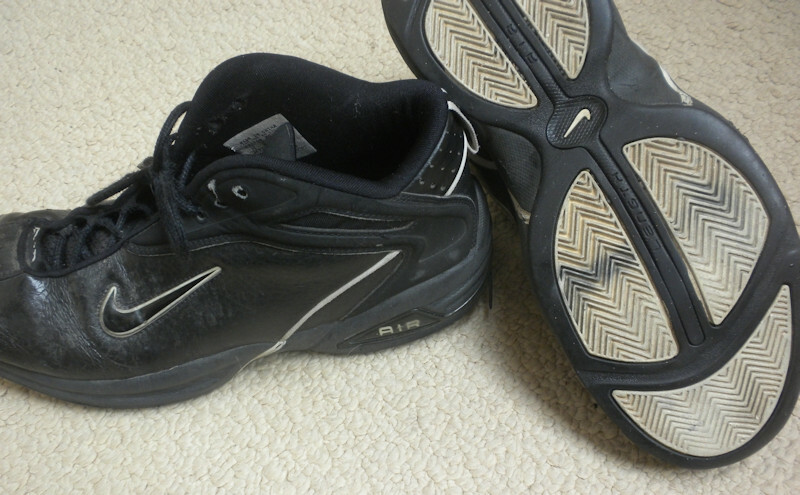 First, your basketball shoes will do just fine unless the black soles rub off and make a lot of black marks on the court. I saw some guys at the court on their hands and knees the other day scrubbing off shoe marks and I got the distinct impression they didn't like it! Second, 9.5 B (M) means women's 9.5 medium width (which is B width). Men's 9.5 B would be a narrow width (D is medium for men's shoes) which is 1.5 or 2 sizes longer than the women's 9.5. But I guess you already figured this out! Finally, be careful starting up tennis again. It's great exercise and it can become addictive! I just played tonight after w*rk. Just got back from playing and wow, was that fun! It was really hard to keep the secret, but I managed to not give anything away. Lena had no idea what the mystery trip was going to be. The shoes fit her perfectly. My back had been sore the day before, and I considered cancelling the whole thing. I had expected it to make me feel old, but it was the opposite. There were no times when I felt like I'd pull a muscle or fall or hurt my ankle. We took it easy, and just rallied, but we actually had some long rallies. Glad you had a good time! I've found tennis relatively easy on my joints compared to running and even swimming. I hope it becomes a habit for you! Nice pics. Looks like foggy Northern CA. Not much different than my childhood neighborhood.